Is your pride/ego holding you back? Tags: Pride, ego, leadership, greatness, learning, humility, power, fear, action. You think your ego/pride might be a problem. You don’t think your ego/pride is a problem. You’re frequently offended by other people. You feel like you’re a pretty confident person. I don’t have any tattoos and never will, but I can easily understand why Ryan Holiday has “Ego is the Enemy” tattooed on one forearm, and the title of his last book The Obstacle is the Way tattooed on the other. Words mean things, and when certain words are committed to memory and are repeated in certain types of situations they change behavior, and thereby can change the course of a life. If you read a book and don’t remember anything about it, its effects are muted. Ryan has made sure the lessons he’s learned writing these books won’t be forgotten, and I’m doing my best to “tattoo” these words onto my brain, because those words, along with the context of the books backing them up, is benefitting my life. Perhaps this book is especially appealing to me because I’m a Mormon, and we Mormons are constantly admonished by our leaders to beware of pride. Reading Ryan’s book was a bit like listening to a talk at my church, albeit without so many spiritual references, instead referencing statements by stoics and other philosophers, although one thing Ryan and Ezra Taft Benson both have in common is that they both quoted C.S. Lewis. Ego is the enemy because when you think you know everything, you can’t learn. If you can’t learn, you can’t improve and you’re stuck where you are, or in the language of the Bible, you’re damned. Damnation is little more than a lack of progression, and the only thing that keeps us from progression is ego, or pride. We might think other people keep us from progressing, but Ryan shows how some of the greatest thinkers progressed the most while in the most debilitating circumstances, like Viktor Frankyl whose famous ideas expressed in his book Man’s Search for Meaning were developed while he was being starved and tortured in a Nazi concentration camp. 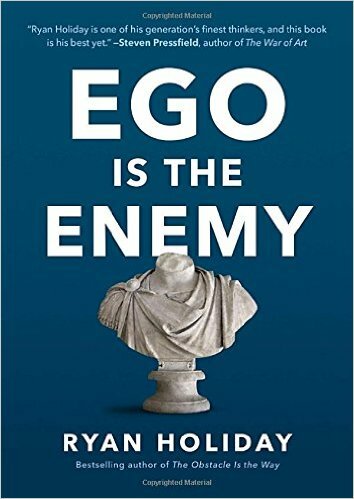 Yes, ego is the enemy, and this book is a good start to arm yourself for the battle.